Gaana+ Free Subscription , Gaana+ Freecharge Offer – Here i am back with Ganna Plus FreeCharge Offer. Gaana is the one-stop solution for all your Music needs. Gaana offers you free, unlimited access to all your favorite Hindi Songs, Bollywood Music, Regional Music & Radio Mirchi – on your mobile phone, no matter where you are. Here i am back with Ganna Plus FreeCharge Offer. Gaana is the one-stop solution for all your Music needs. Gaana offers you free, unlimited access to all your favorite Hindi Songs, Bollywood Music, Regional Music & Radio Mirchi – on your mobile phone, no matter where you are. 2. Open App and Login using your freecharge details. 3. 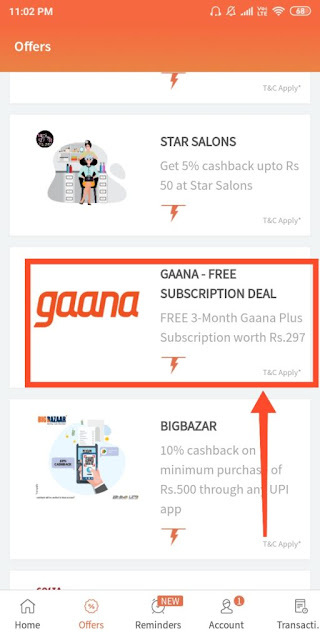 Now Click on OFFERS section from bottom Tab and Find GAANA from list. 4. Now Click on Buy Now Option and Pay Rs.1 using any method. 5. You will get your voucher instantly on screen. 6. Redeem it on Gaana Plus App and Voilaa you will get Free Gaana Plus Premium at Rs.1 Only using FreeCharge. 1. 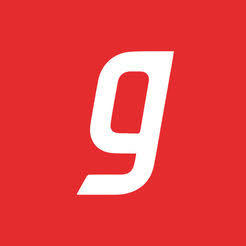 Login/ Register on Gaana App. 3. 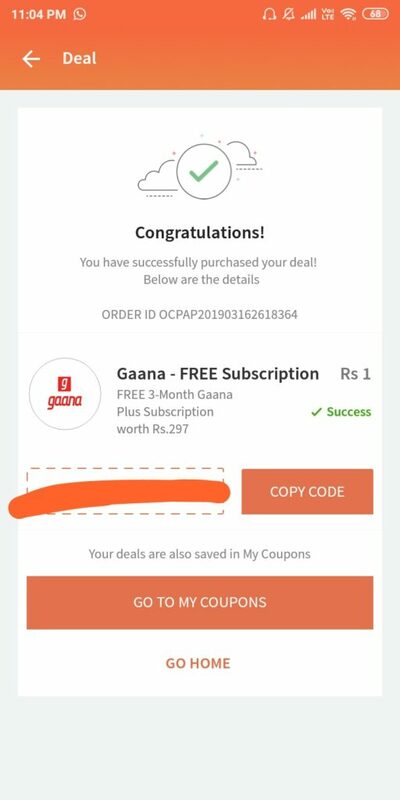 Enter the Unique Coupon Code & enjoy your 3 Months Gaana Plus. 4. Code can only be redeem on web. 5. In case you are not logged in on web/wap, you would need to login first. 6. Apply the coupon code under redeem section. The deal is valid in the territory of India. This order is not transferable. 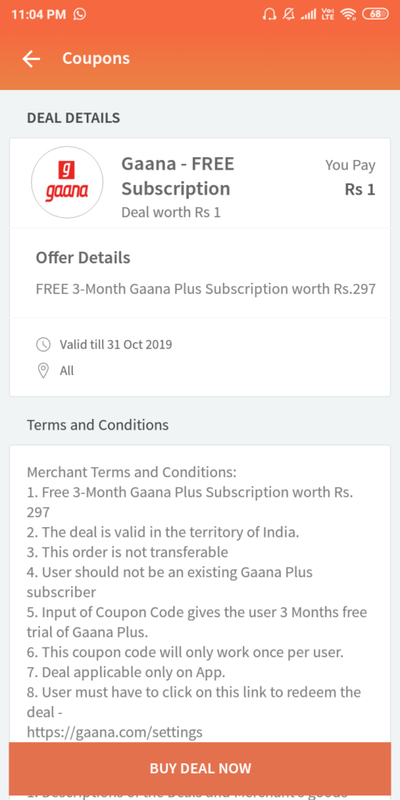 User should not be an existing Gaana Plus subscriber. Deal applicable only on App. Descriptions of the Deals and Merchant’s goods and/or services are provided by the Merchant and Freecharge is not responsible for any claims associated with these descriptions or for the quality of goods and/or services provided by the Merchant. Freecharge shall not be responsible if the Merchant fails to honor the Deal. Freecharge’s liability in such case shall be limited to the amount paid by the Customer to purchase the Deal. Reproduction, sale or trade of Freecharge deals is strictly prohibited. Freecharge reserves the right to disqualify any Freecharge Account from the benefits of this Deal in case of any illegal, suspicious, fraudulent or potentially fraudulent transaction/activity or misuse of the Deal. We reserve the right to end/modify all or any Freecharge terms and conditions applicable to this Deal. The Deal is subject to Freecharge Terms and Conditions available on the Freecharge website.